Teaching Will: The Shakespeare Club: We've Been What? On Performance Day I give a chit-chat to the audience before each show. I have motives, and they're not altruistic. "I'd like to direct your attention over here to my left to what I like to call 'The Shakespeare Club Museum'." 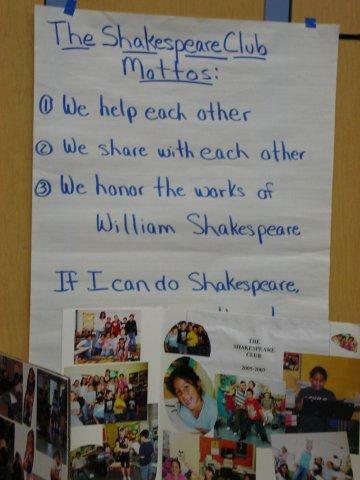 Atop tables I've set up photo displays of the five years of Shakespeare Club. The pictures are mostly candid shots of the kids rehearsing, doing warm-ups, making props or goofing off. "Along with the photo collage there is an Honor Roll of club members who earned special mention for acting or writing. Some have made Honor Roll because they went out of their way to live up to our mottos: We help each other and we share with each other." Parents and relatives like to take pictures of the Honor Roll when they see a familiar name on it. And the kids, both current and from years past, love to pore over images of their younger selves. The museum is popular and draws crowds. 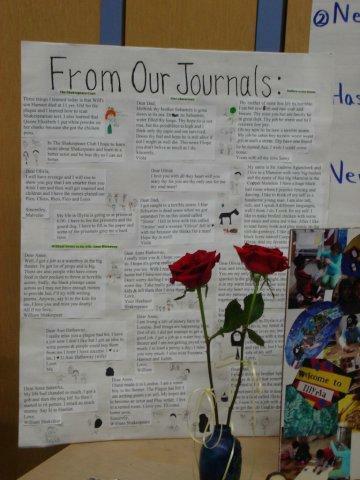 "There is also a board with excerpts of the children's journal writing. And finally, I'd like to point out our Shakespeare Club donation box. 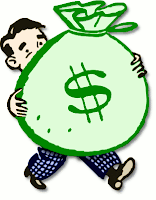 If you have an extra nickel or dime we could use it to feed the actors and fund the props." The donation box is an empty square tissue box covered in tin foil and with SHAKESPEARE CLUB DONATION BOX printed on all four sides. Highly unprofessional, but I figure we're an elementary school with a small-town feel. At the one o'clock performance, a parent stuck a hundred-dollar bill in my hand and said, "I don't want to put this in the box." "Sure, no problem," I answered...and twigged, problem. But I had so many other problems that I didn't think about it again. I did, however, go to the box and emptied out some donated bills totaling thirty-six dollars. I left six dollars to encourage other donors. 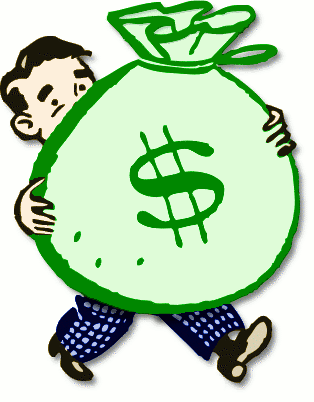 GRUMIONothing comes amiss, so money comes withal. After the three o'clock performance, I was busy with dinner and a movie for the kids. At the end of the night, I got the shock. The box was empty. Even the lousy six dollars was gone. But, but, but...we're an elementary school with a small-town feel. Lesson learned, Ms. Ryane. Get a professional box with a professional lock on it. I have no idea who did it and I don't want to know. I only hope they really, really needed it. So, the Shakespeare Club this year made $136 in donations. Adventure is a wonderfull life. I will tell you one of my adventures. One day I was hikeing in the woods, I found a large black cave. I was scared to go in at first. But I remembered I had a flashlight. So I went in …splash! I fell into a underwater lake. I swam to the edge. I looked for a exit. The ground fell! I was falling fast. It was so scary. I saw a dino. I ran so fast. It chased me to a mountan. I climed it to where it was snowing. I found some shushi. I thought, "Why would shushi?" I ate it. I was transported back! But I fell down in the cave again. And started all over. But this time I brought a gun. Like you, I hope that thief really, really needed it. I'm doubtful though. A few weeks ago a friend had her great-grandfather's metal milk jug stolen off her porch. Two friends in an online group of seven had their houses broken into and many things stolen the prior week and one friend the same 20 years ago. That's three of seven! Someone rifles through my church's mail every few weeks to find a few dollars. I'm doubtful that any of their "desperation" is the kind I would be understanding of. Theft is theft. And it's more than taking something that someone else owns. It's an assault against other people, it damages both thief and victim, and it often damages more than the thief or the victim understands at the time. It breaks more than the communities it enters. I'm so sorry it entered your beautiful supportive learning community. You are so right on every count.Next year better, I hope.